The popular bookmarklet from Arc90 relaunches as a paid subscription service that hopes to reboot how content gets read — and paid for — on the web. I use a bookmarklet called Readability every day: one click, and it transforms any article, blog post, or long feature from a Flash-addled, ad-encrusted headache into a calm, humane… readable experience. 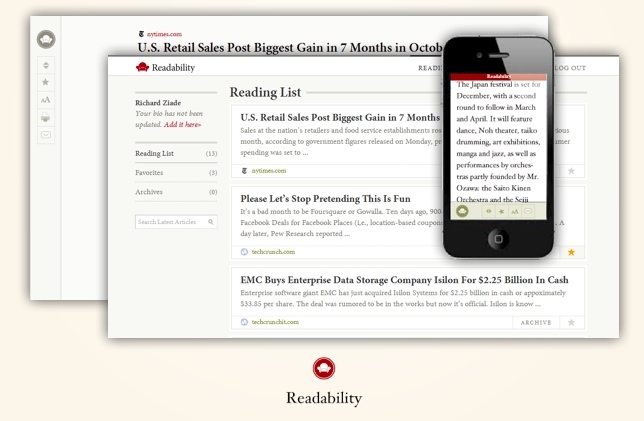 Now Arc90, the web design and development firm behind Readability, is relaunching the bookmarklet as a “premium” (ie, paid) subscription service with big ambitions: not just making the web a more readable place, but rebooting the way online publishers and content creators get paid. Tools like Readability and Instapaper are often, and erroneously, described as “undesigning” the web by readers who equate “design” with distracting layouts and irritating user interfaces. To them, Readability is a cleansing purge. To some designers and art directors, the rise of Readability augurs something more sinister: a wholesale rejection of design choices that turns the web into a bland, homogeneous tapioca. And to publishers, any webapp that strips out ads — their sole, feeble revenue stream — is something to be eyed with suspicion at best. Rich Ziade, the original creator and designer of Readability, thinks that his rebooted service will address all of those concerns. To readers who cheer “undesign,” Readability actually offers better design optimized for its eponymous use case: a “business class” reading experience versus the “coach class” that already exists as the web’s default. (The “Read Now” functionality will remain free; a new “Read Later” option, integrated with Instapaper, is part of the premium service.) To publishers, the new Readability provides tools to track what content is being pushed through the platform and frictionlessly monetize it without resorting to paywalls (more on that below). Even better: publishers and designers don’t have to formally partner with Arc90 to take advantage of these tools. Readability offers free code to embed “Read Now/Read Later” functionality — with built-in options for redesigning the display text — into any webpage as-is. But if publishers do choose to partner with Readability, they can leverage the platform’s unrestricted API to build their own custom-designed “themes” that get activated by those buttons. 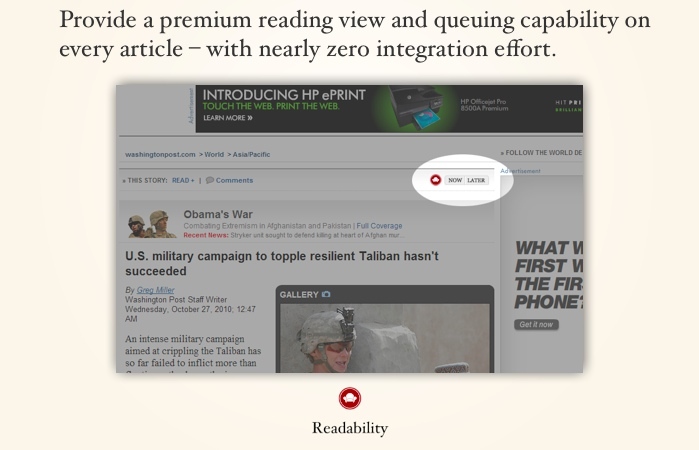 Free code from Readability lets any publisher or content creator add “Read Now” and “Read Later” buttons to their articles. 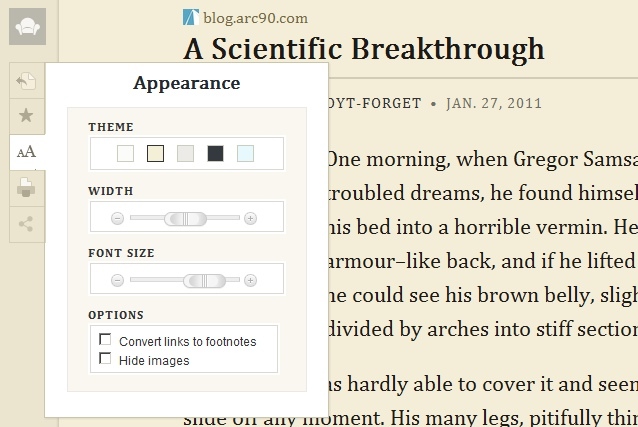 Tools in the Readability display let the user choose “themes” to redesign the content for better reading. Soon, designers and publishers will be able to build and add custom versions of these themes. There are a zillion reasons why it won’t work. (For one, Readability-ing something is a poor proxy for actually reading it: just look at my dust-gathering Instapaper queue. Another: in Arc90’s percentage-allocating payment system, the more articles I read, the less publishers get paid. Wha?) But if it does work the way Ziade hopes, Readability may accomplish something that no digital publisher has yet figured out how to do: please readers and make money, using the power of good design. It shouldn’t be that simple. But maybe it is.